FORMER prime minister Gordon Brown said the Conservatives are “whipping up anti-Scottish feeling” in England and threatening the “unity” of the UK as he entered the general election campaign last night. The man credited with reviving the referendum campaign for the No camp sought to do the same for Labour’s election in Scotland as he declared there will “never ever” be a deal with the SNP to get Ed Miliband into Downing Street. Instead, he claimed Nationalists only flourish when Tories succeed and a large tranche of SNP MPs at Westminster would only agitate for independence if they make sweeping gains in the election. Mr Brown set out plans to give food banks £1 million within 24 hours of a Labour government to reclaim the party’s social justice credentials. He said this was what lies behind English votes for English laws and this week’s “Carlisle principle”, Prime Minister David Cameron’s proposed audit of the impact of Holyrood policies on the rest of the UK. He pointed to recent Tory posters depicting Ed Miliband in Alex Salmond’s pocket and of First Minister Nicola Sturgeon as the Labour leader’s puppet master. The notion of the SNP holding power at Westminster was branded a “terrible prospect” by Mr Cameron. He claimed Scottish Nationalists “wouldn’t care” about the rest of the UK, despite Ms Sturgeon’s assurance that SNP MPs would be “positive and responsible”. The Tory tactic towards Scotland has already come under fire this week from former Conservative Scottish secretary Lord Forsyth. Mr Brown said that despite the continuing speculation surrounding an SNP/Labour deal, it would “never ever happen”. Support for the SNP stands at 49 per cent according to the most recent YouGov poll this week, with Labour floundering on just 25 per cent. This would see the Nationalists gain 40 to 50 seats and leave Labour unable to form a majority. But SNP claims they could hold the “balance of power” after the election were dismissed as an attempt to make the party seem relevant. Referring to the recent video which emerged of Mr Salmond joking he would be writing a Labour Budget after the election, Mr Brown said: “There is no chance of Alex Salmond ever writing a Labour Budget. “This idea that the Scottish National Party has an interest in electing a Labour government is totally fictitious. Instead the Nationalists want to persuade people in England not to vote Labour, he said. “They are no friends of Labour and over these next few days I think it’s important that we tell people this. Mr Brown sought to lay out Scottish Labour’s social justice agenda, announcing that 167 Scots food banks will get emergency payments of £5,000 each to tackle poverty. He said that 5,700 food bank parcels were distributed in 2011, but last year this had rocketed to 117,000, which he described as a “scandal”. Although this began under the Tories, he said that the SNP government at Holyrood had failed to alleviate the problem. 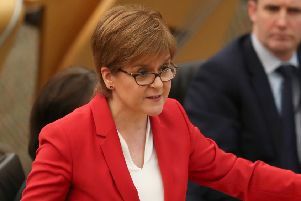 The former prime minister said the SNP government had refused to use its powers to alleviate the impact of the Bedroom Tax after finance secretary John Swinney claimed they did not want to “let the Westminster government off the hook”. “So thousands of people were to be left on the hook because he was not prepared to take action to let Westminster off the hook. “He wanted to prove not that Westminster could work, but that Westminster couldn’t work. He put the argument for independence before the immediate need to relieve poverty. “He wasn’t so much interested in ending the bedroom tax as in exploiting the bedroom tax.